Movie theaters from around the state that made our A-List. Forget about $15 tickets and dizzying displays of digital wonder—these movie theaters are a little bit old school, a little bit indie, and full of character. 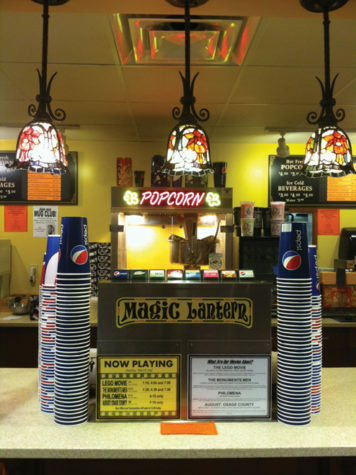 Grab a beer, some popcorn, or a locally brewed hard cider, and settle in to enjoy the show. The only surviving theater of the three cinemas that served the Rockland area in the 1920s, the Strand has been beautifully restored and updated to reflect the advances of the digital age. 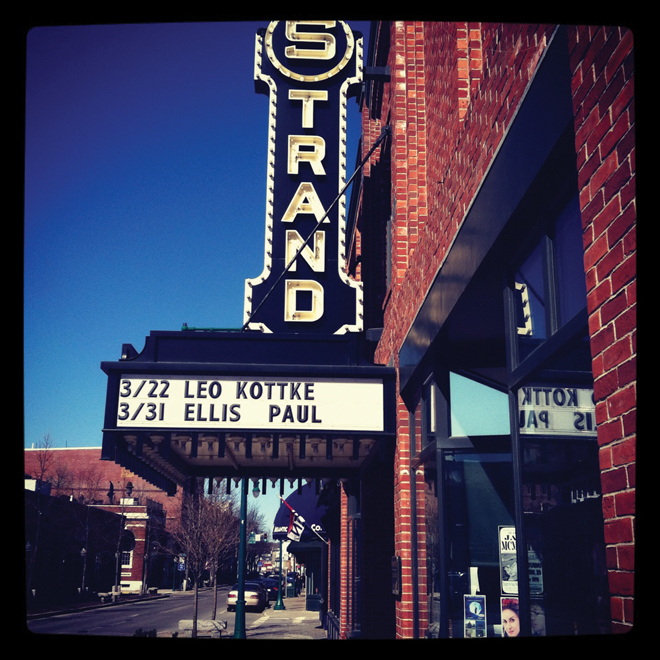 Indie films, blockbusters, and local flicks are all shown on the Strand’s big screen. Live acts, including everything from stand up to world music, round out the schedule and help make this old structure a cultural hub for the midcoast. Frontier is many things: a fantastic restaurant that serves health-conscious and delicious meals, a contemporary art gallery, a theater for performing artists, a home for intellectual events like the annual TEDxDirigo. Movies like Oscar-nominated shorts and the new documentary from Michel Gondry are natural additions to the brainy lineup. Watch Noam Chomsky pontificate before heading to the bar to down a few cocktails and share your own two cents. 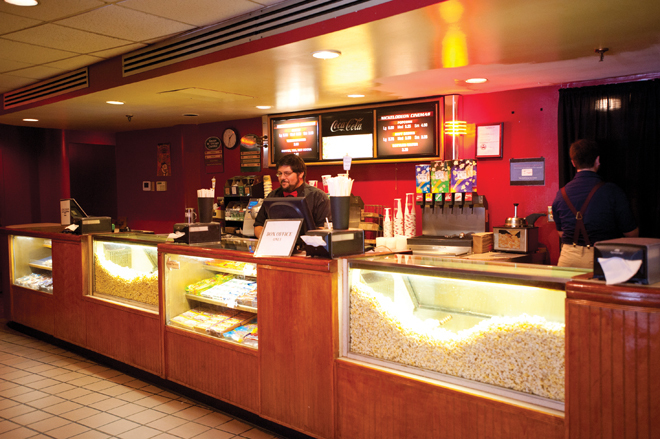 Owned by Patriot Cinemas, the Nick, as it’s commonly called, is a Portland institution. Located off Monument Square in the Old Port, this is the best place to catch Oscar-worthy dramas and big summer blockbusters. Head over on a Tuesday for $5 tickets, or check out a weekend matinee. Another great thing about the Nick? It’s within walking distance of many great restaurants—you can grab beers at Novare Res, dinner at the Grill Room, or coffee at Bard and still make it there in time for previews. Only 100 movie buffs can squeeze into this tiny theater at a time, but the intimate quarters only make the experience more special. Perch on couches, rocking chairs, and theater seating while you watch the expertly chosen indie film of the week. While Eveningstar may not have all that many options, the films they do screen are all must-sees, from Spike Jonze’s intellectual teaser Her to Richard Linklater’s dreamy Before Midnight. 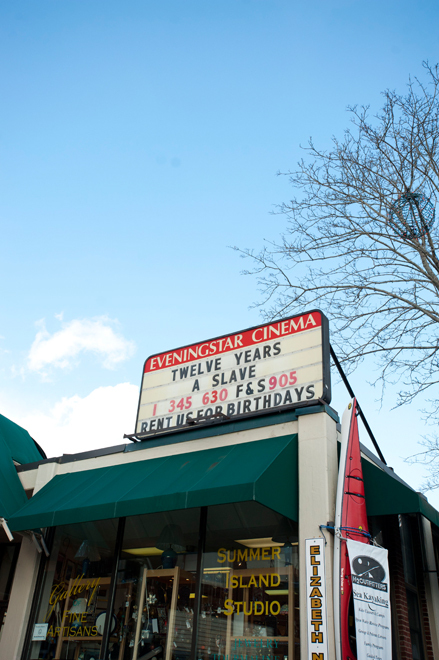 And despite its odd location inside the Tontine Mall, Eveningstar is still locally owned and operated. No theater in Maine is as immediately recognizable as the Colonial (save possibly the Strand, with its distinctive neon sign). A whimsical elephant sits perched on top of the pastel-painted building. During the day, the green, pink, and purple stripes almost glow, an effect that is enhanced by winter’s gray tones. Inside, moviegoers are treated to a nice selection of Hollywood favorites and sleeper hits. 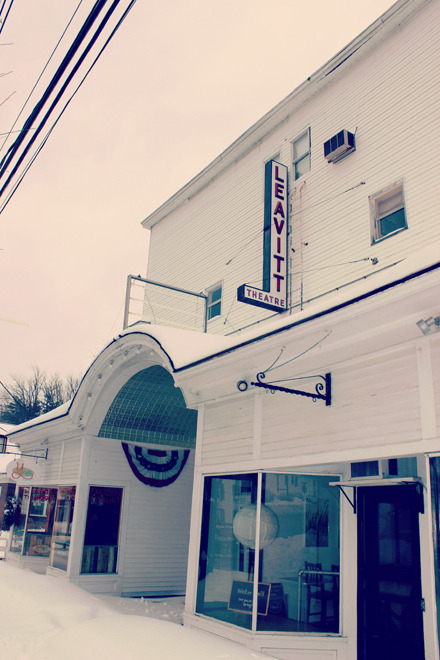 This historic theater has certainly seen better days, but thanks to the support of the some generous donors—and a successful Kickstarter campaign—the Leavitt will continue screening films. Behind the beautiful white facade lies an old-fashioned movie palace that screens an impressive array of vintage and classic films. Nothing quite completes a great beach day like watching Jaws wreak havoc on swimmers on a big screen. The Magic Lantern makes date night effortless by combining those two essential ingredients: dinner and a movie. While they don’t allow in any big bags (thus making it impossible to smuggle in an Italian sub) they make up for that inconvenience by offering a menu of tasty pub grub, complete with wine and local brews on draught. 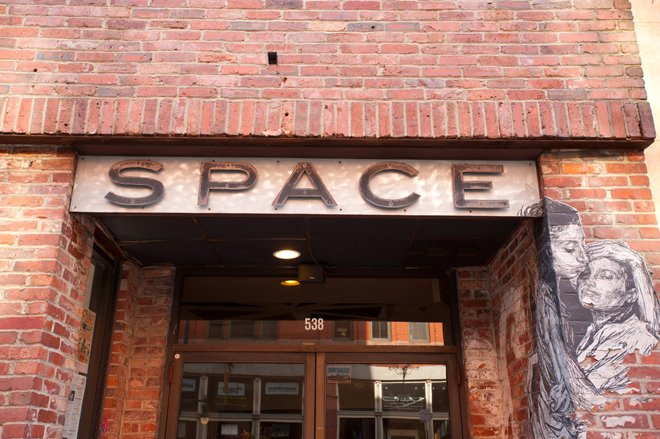 Perhaps best known for their live music, or the innovative visual art that brings in visitors from afar, Space Gallery is also a fantastic place to see a movie. Every few weeks, the relatively small main room transforms into a theater, complete with a bar serving Urban Farm Fermentory ciders, among other beverages. 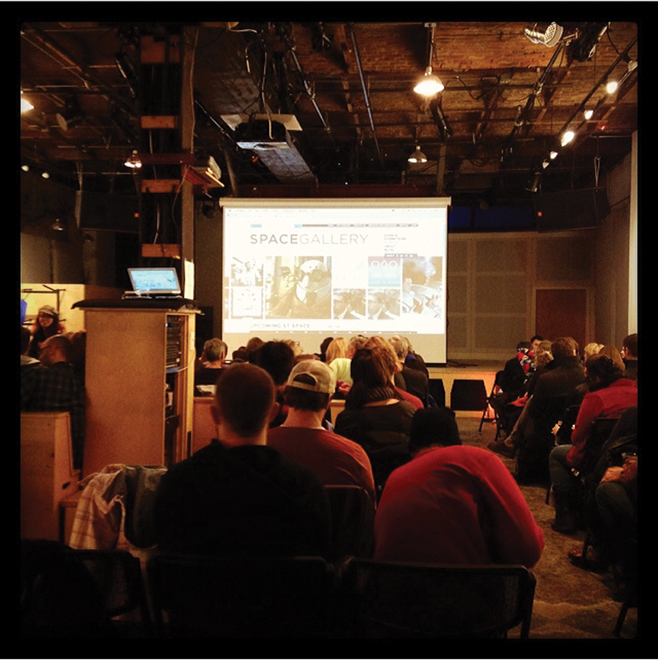 The cozy, cool sense of community is strong enough to make you forget about the folded-chair seating, and the riveting selection of films will give you cocktail conversation fodder for months. When it comes to drive-ins, Maine is pretty spoiled. Although nowhere near as popular as they were in their heyday, drive-in theaters are still showing movies, and there are few as beloved as the Saco Drive-In. Owner Ry Russell has developed a loyal following of both local regulars and summertime visitors. Just last year, as the drive-in faced closure, Russell used social media to motivate the masses and raise funds for the 75-year-old theater. This summer, show the outdoor theater a little love by checking out a film on their newly digitalized system.